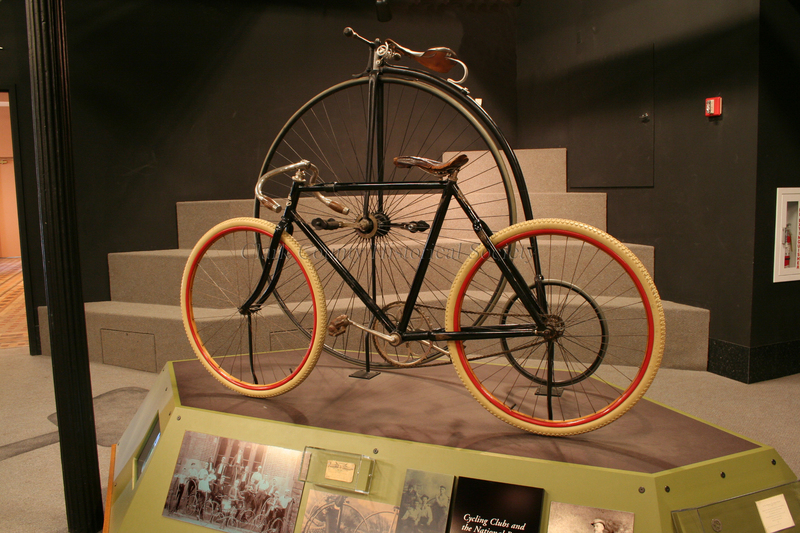 On Wednesday, August 6, we shared a new WHAT is it artifact photo on our Facebook page to see if anyone could identify what it is. This was a tough one and there were a lot of great guesses, and only ONE right answer. This is a pen. 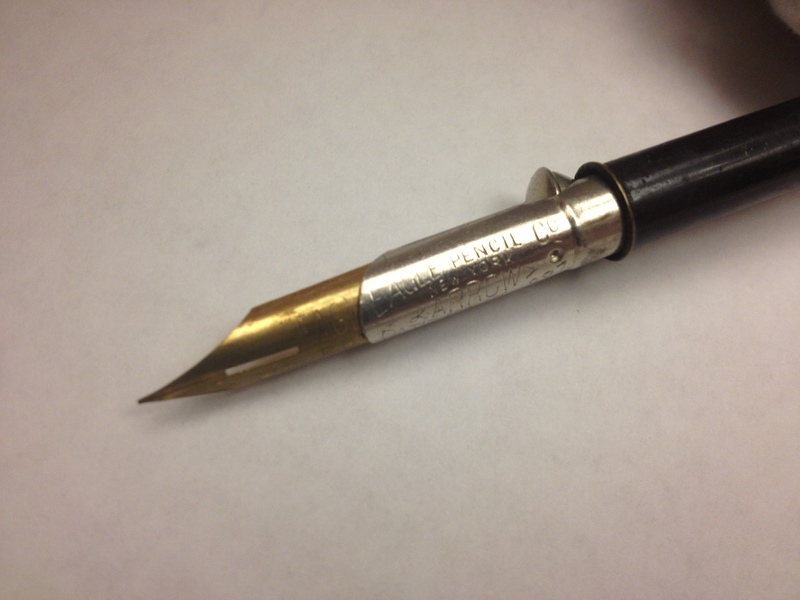 But not just any pen, it’s a push button retractable Arrow dip pen, made by the Eagle Pencil Co. of New York. At first glance, upon seeing the clickable end, a few staff members here did this this was a pen, but when we clicked, nothing happened. 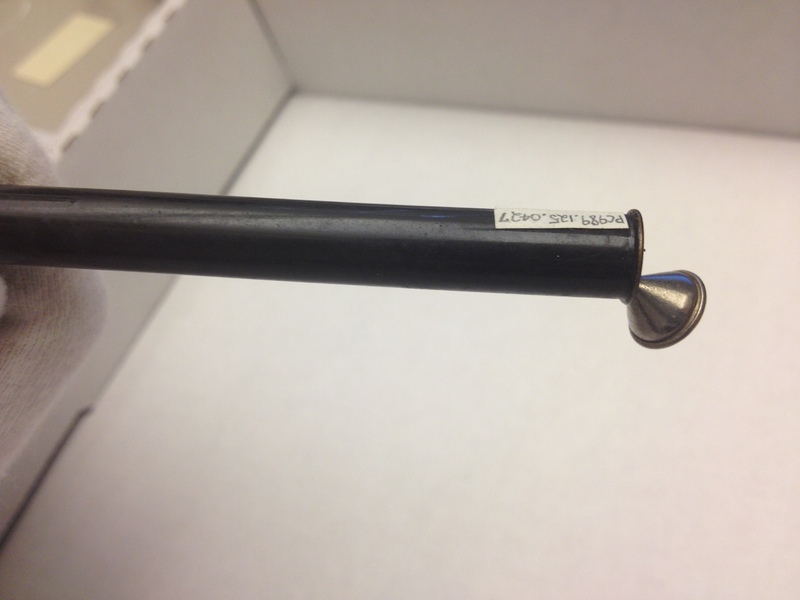 Our curator Kasey stumbled across the pen while working on the inventory of room 6 on our second floor. 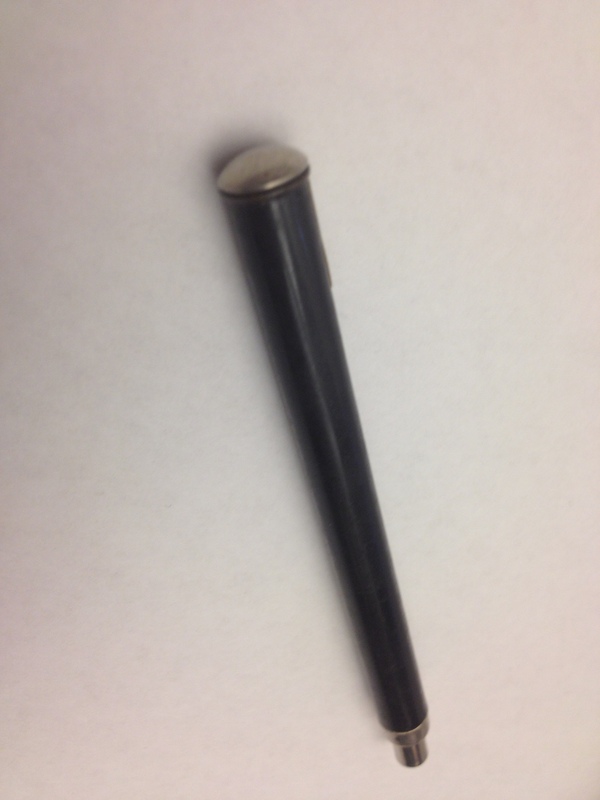 She says she was puzzled and clicked it off and on for a few moments while holding it vertically…it wasn’t until she tipped it at just the right angle that the bottom detached and the pen tip dropped out. 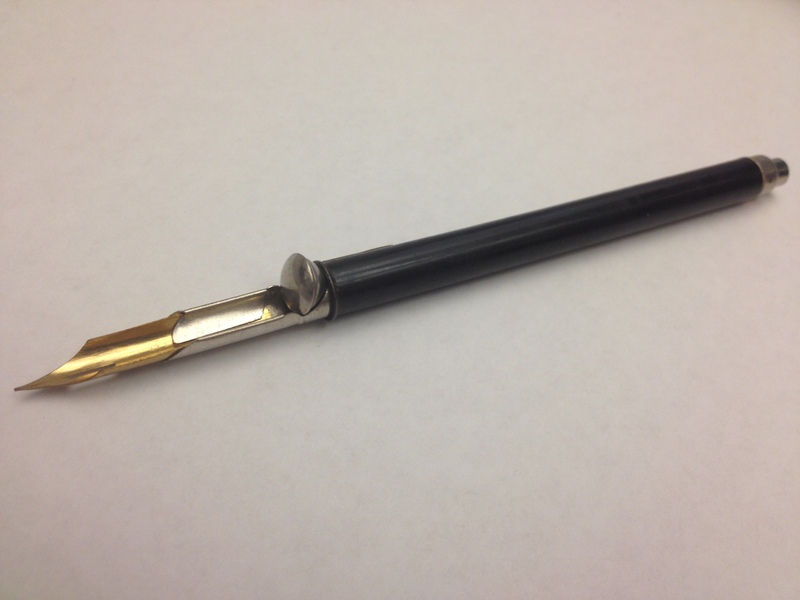 The piece the drops out of the bottom clicks into place to hold the pen tip. It’s really pretty neat! 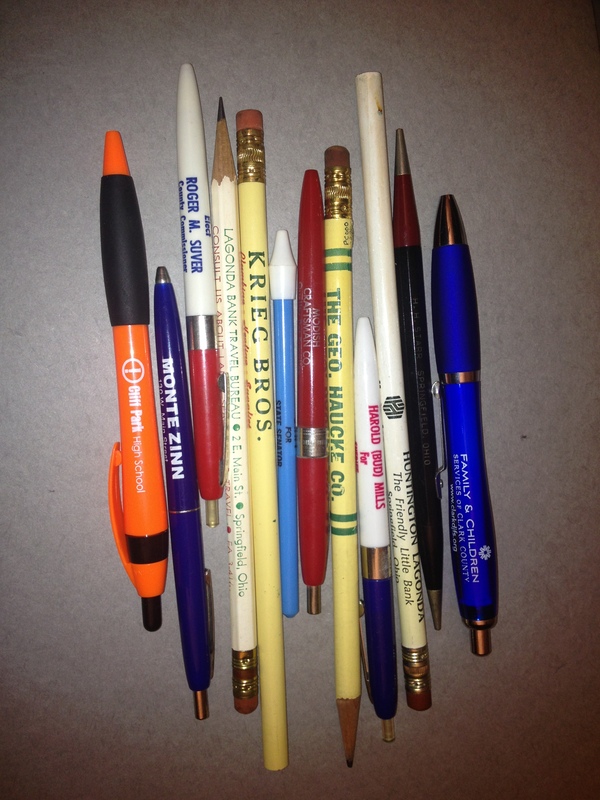 Just for fun were pulled some other more modern writing utensils from the collection, representing several local businesses, schools, campaigns, etc. 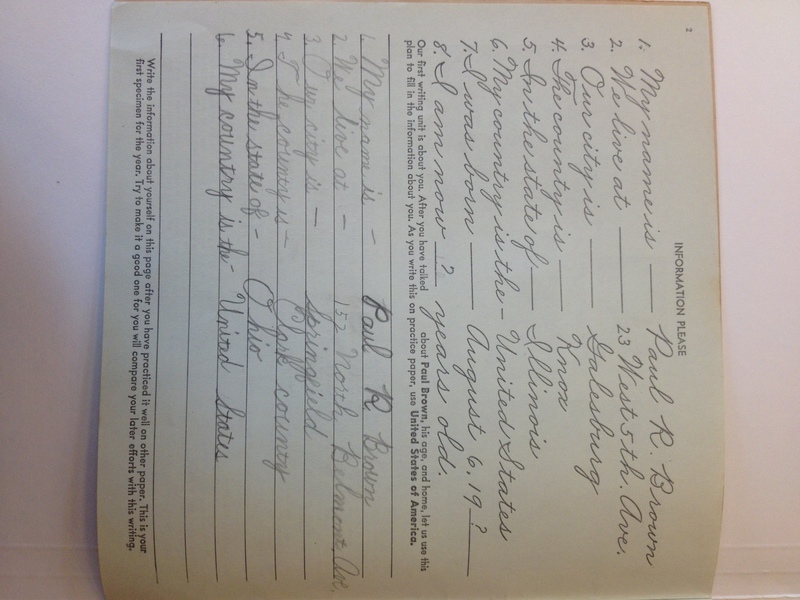 In the archives we have several handwriting primers in our Educational Materials Collection. 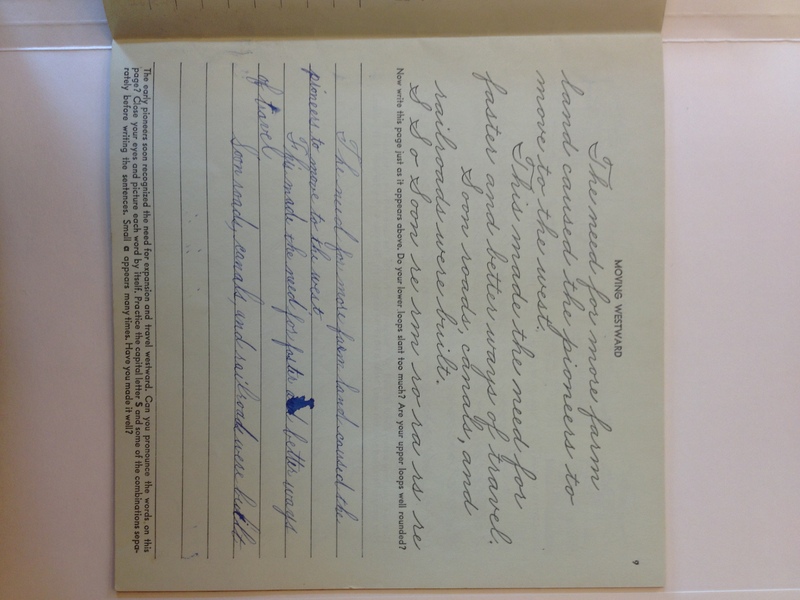 Here are a few pages from two different 1948 Zaner-Bloser books. Look familiar to anyone? We also have quite a few student desks that contain spaces for inkwell, including the one here. 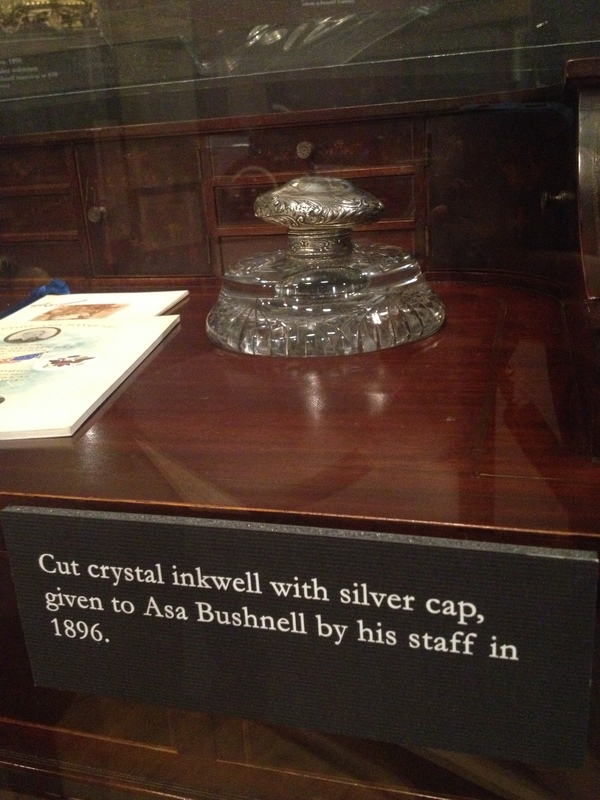 Our fanciest inkwell by far is Asa Bushnell’s crystal number shown here, given to him by his staff in 1896. 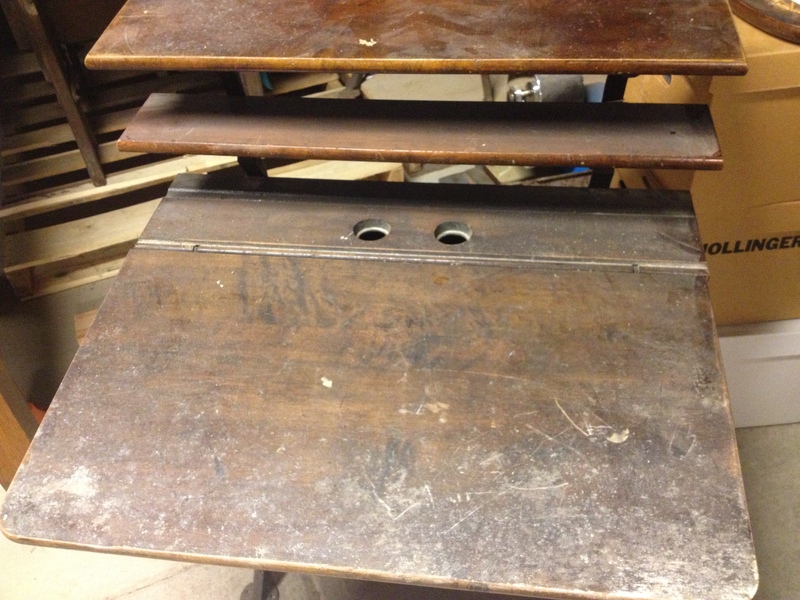 Student desk with hole for inkwell. 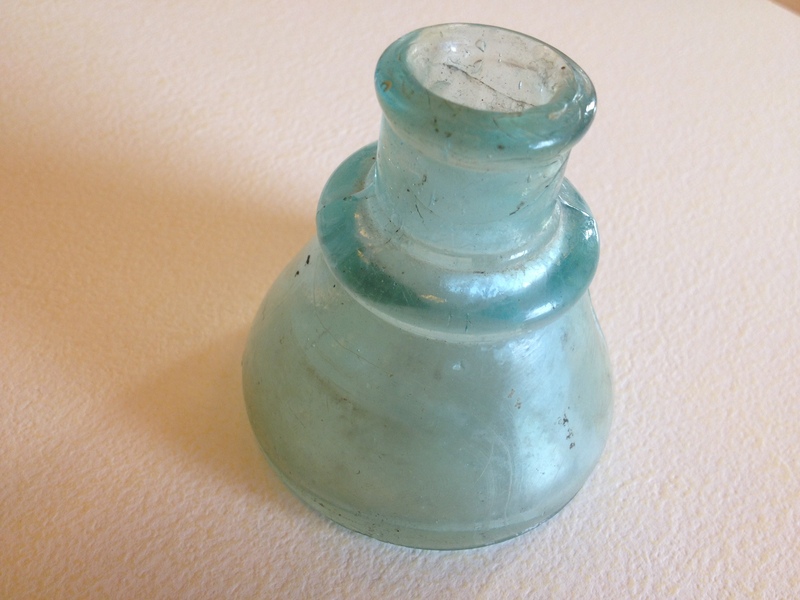 On July 16 we shared a WHAT is it Wednesday artifact photo on Facebook to see if anyone could guess what it was. We had some good guesses: a waterproof document case, a money belt, butcher’s sleeve, barber’s cloth…but no one guess correctly that this was a flag case! 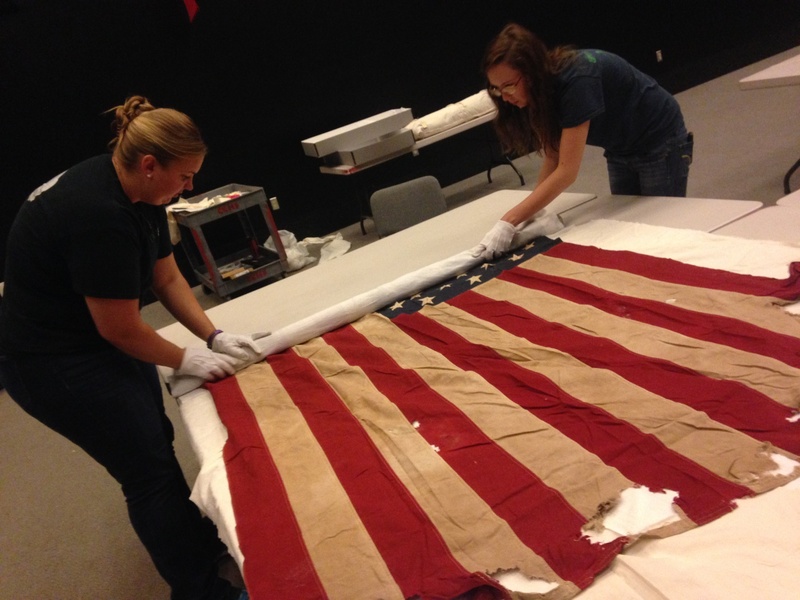 Two of our Wright State Public History graduate interns, Sara and Georgia, have spent the past week days going through the flags in our collection and assessing, providing care, and rewrapping and tagging them so that they are stored better. 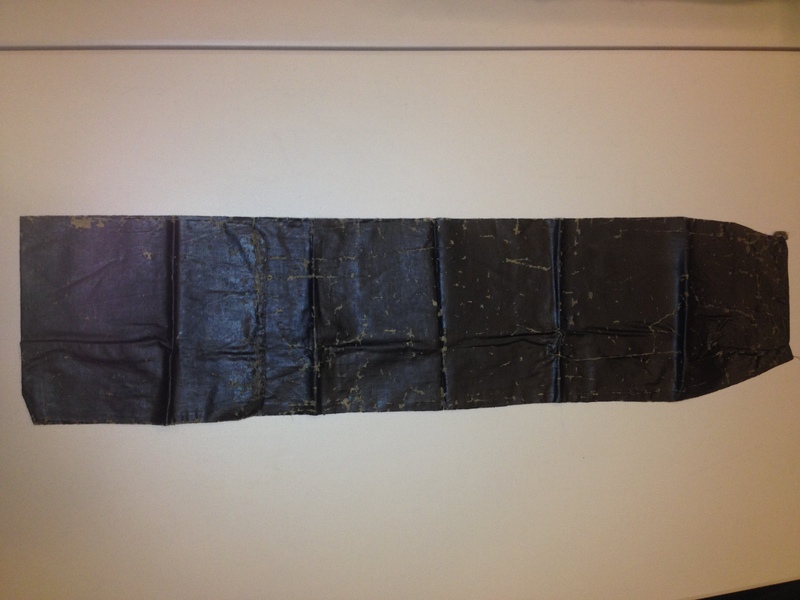 In one of the first boxes of flags, which contained Spanish American War era and Keifer Camp (GAR) flags, they came across this skinny leather case and were puzzled about its use. Luckily, Mel (an Army veteran and Civil War reenactor) was nearby and he recognized it right away as a flag case that is used to “case the colors” for a military unit when the unit is deactivated. 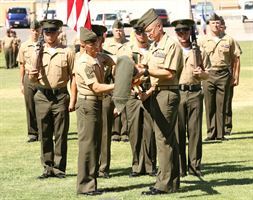 It is traditional to hold a casing of the colors ceremony, which includes a reading of the history of the command, before the unit’s distinctive flag, or “colors,” are furled or “cased” in a protective sheath. The sheathed flag is then returned to the unit’s flag bearer, who marches off the field signaling the formal end of that command. We found a few recent pictures online of military units casing their colors to give you an idea of how the case was used. 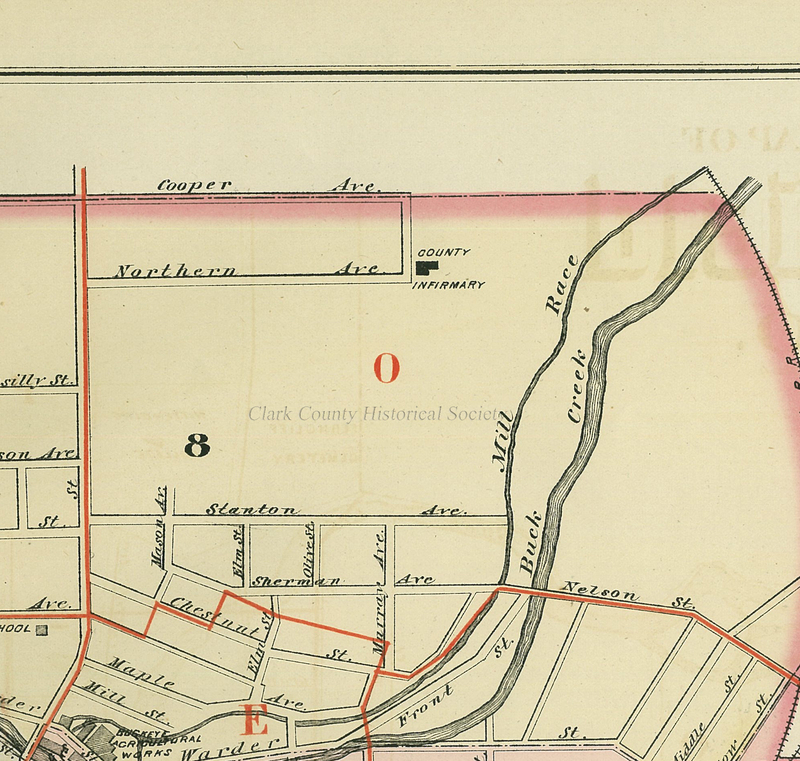 Unfortunately, this particular case does not have any information about how and when exactly it was used. 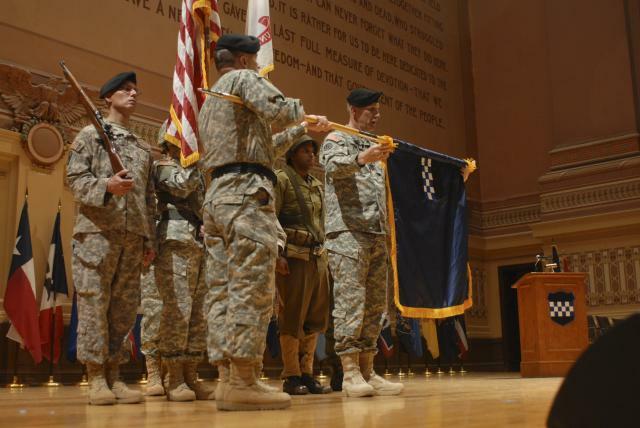 The 99th RRC color casing ceremony, April 2009. “Darkside” Marine Battalion, the most deployed battalion of the last decade, casing their colors, May, 2014. 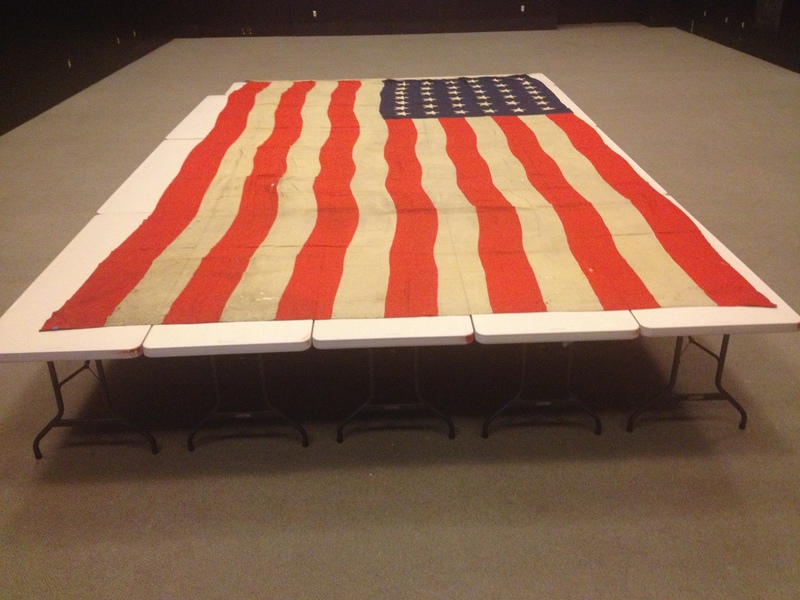 One of the neatest finds over the past few days of flag wrapping was an ENORMOUS 38 star flag that was used from 1877-1890. It has holes along the top indicating that it was probably hung on the wall of a building in the area, but we are not sure about the details. We wanted to share some pictures of Sara and Georgia working on the flags and we’ll be sharing their blog post on the experience later! In the archives in our “Miscellaneous Military” collection we found a few other neat things on flag including a 1976 booklet on historic flags that was distributed by Big Bear Grocery for the Bicentennial, a Revolutionary Flag coloring book, also from the Bicentennial, and a page from a booklet on flag history about how to display the flag. 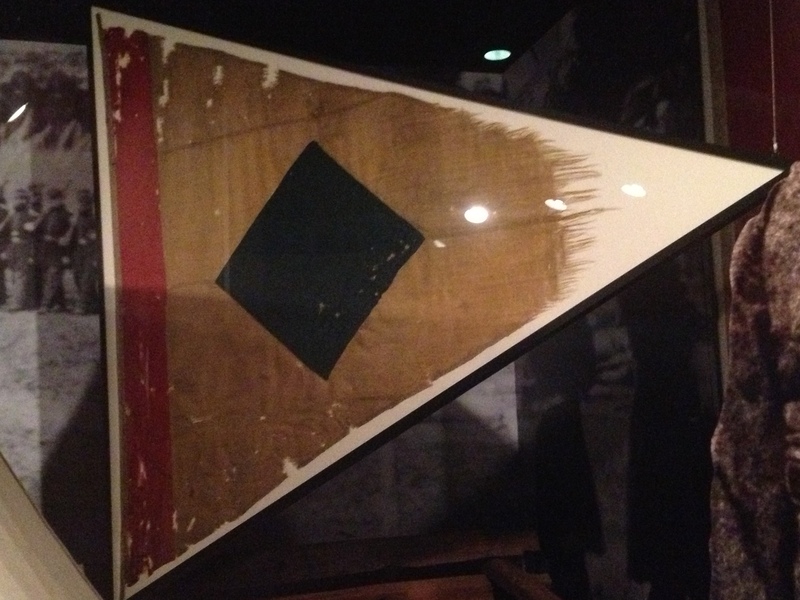 We have several flags on display in the museum, including the 110th regimental flag from the Civil War, General J. Warren Keifer’s Headquarters flag from 1863, seen here. 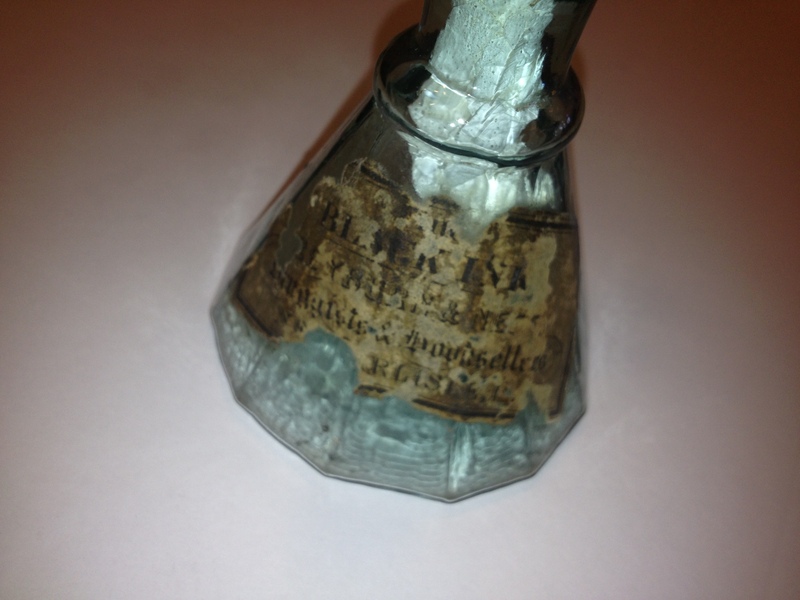 On June 25 we shared this image of an artifact in our collections to see if anyone could guess what it was. 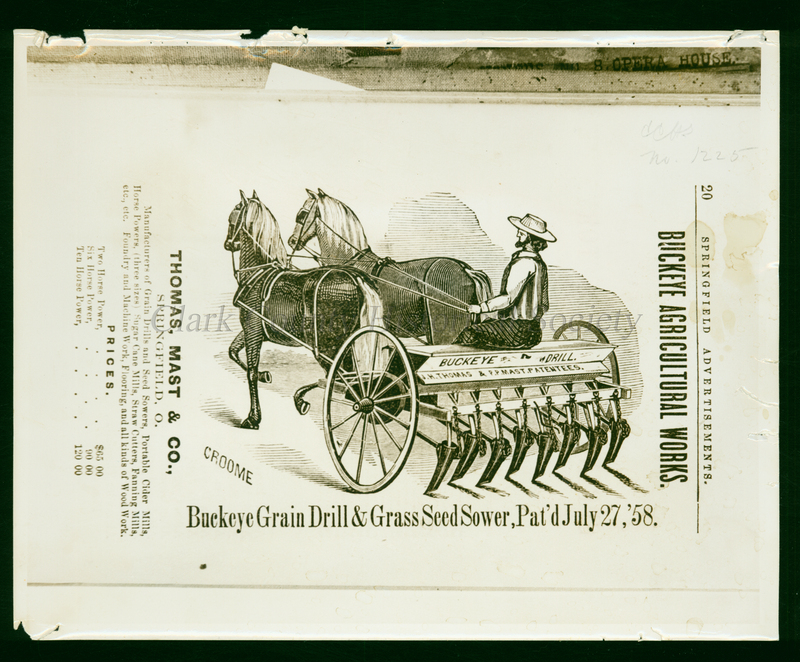 Our curator Kasey came across this artifact while working on the NEH and History Fund grant funded Collections Management Project in our second floor storage area. 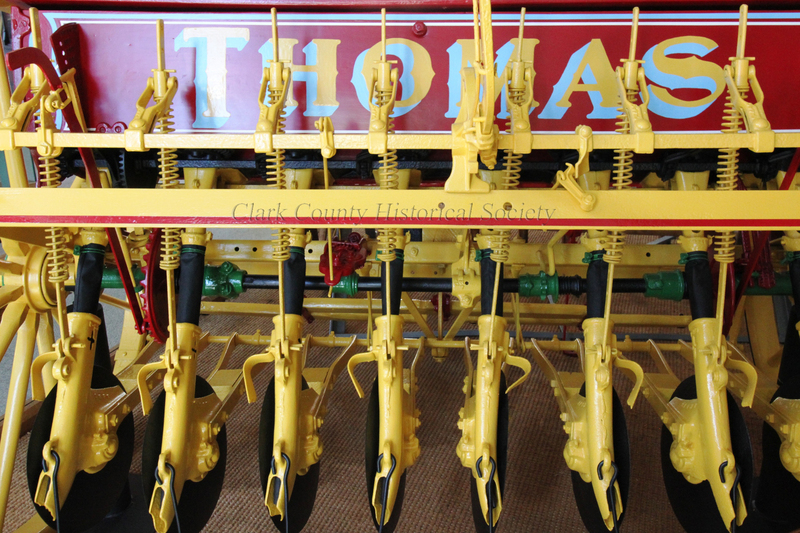 There weren’t a whole lot of guesses….seeder, grinder….thing-a-ma-jig (always a good guess!) and as usual, we revealed the answer the following day. 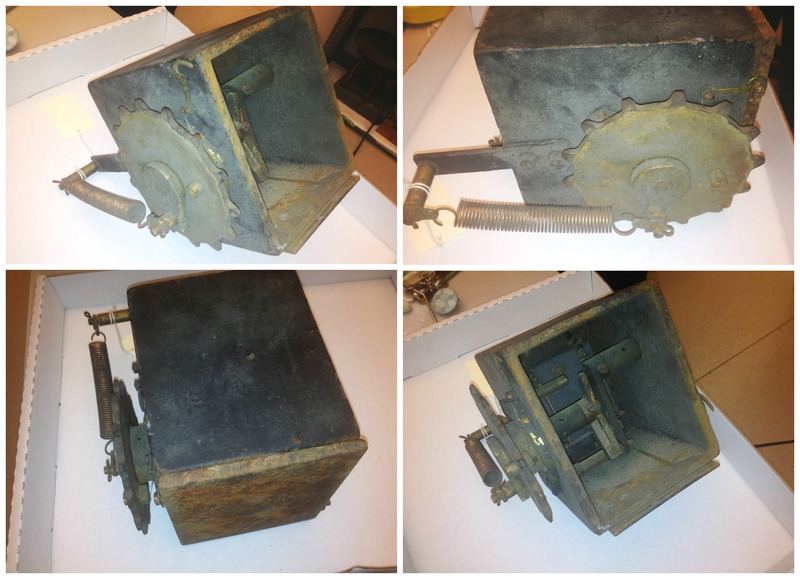 This was one of four motors that controlled the faces of the clock on our building’s clock tower. 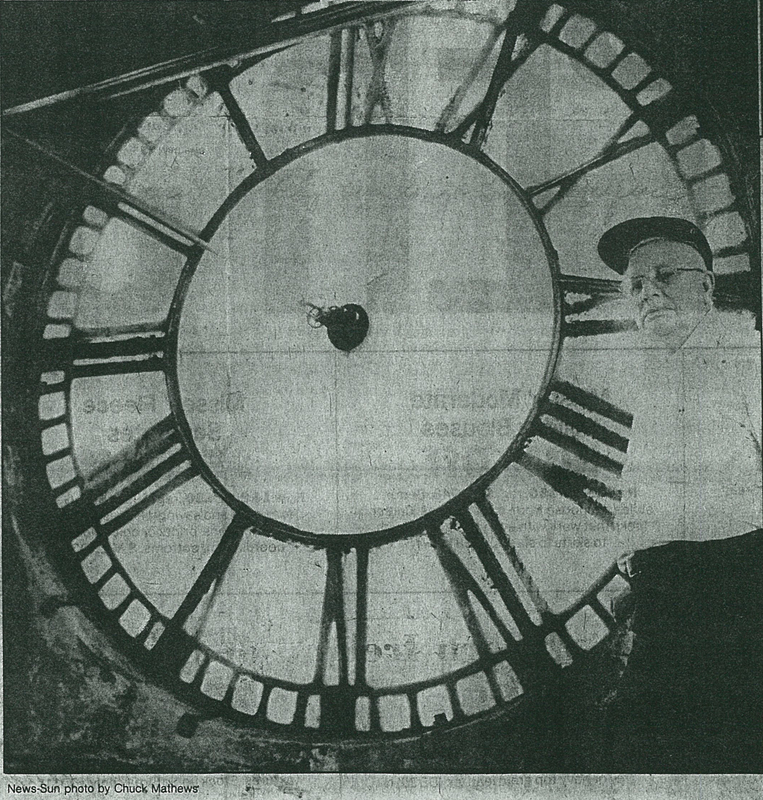 The motors were replaced in 1984 when Carl Everingham repaired the clock and got it chiming and working properly for the first time since the 1950s (around the time the two tower steeples were removed). 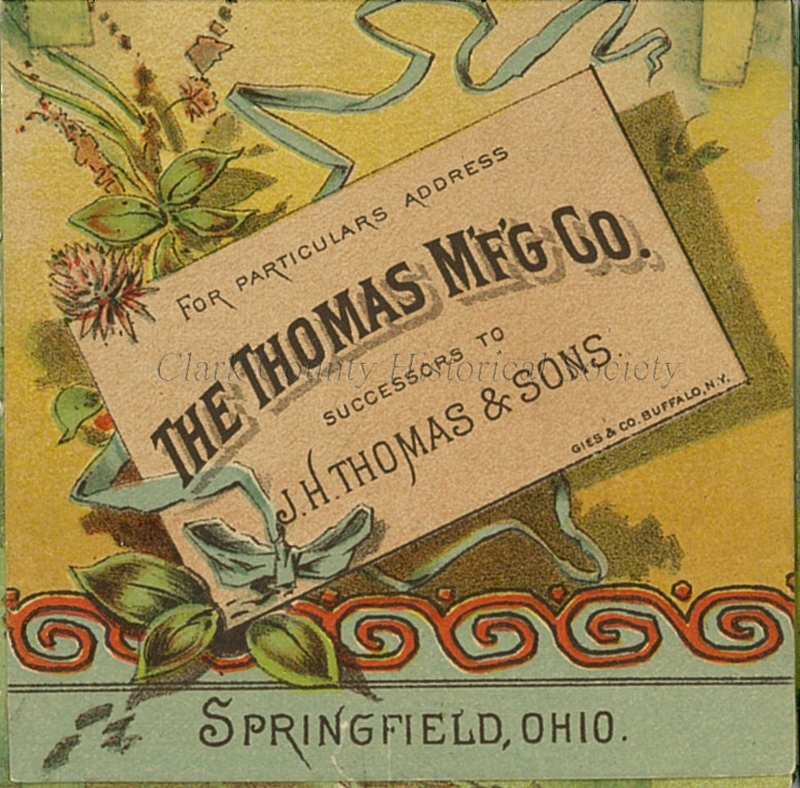 Mr. Everingham offered his expertise to repair the clock free of charge and received help from Harry Laybourne and his sons, Bill, James, and Rick. 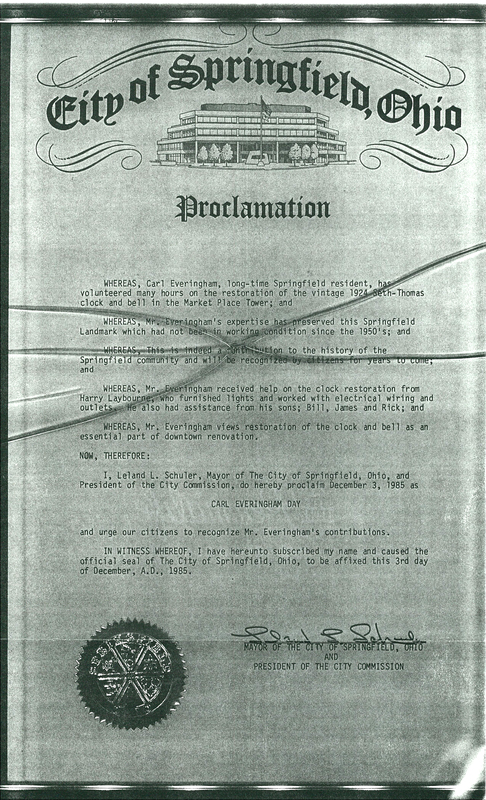 In honor of his service, December 3, 1985 was declared Carl Everingham day. Carl Everingham behind the clock face. 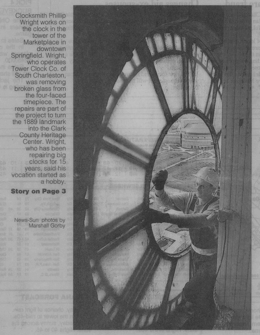 Phillip Wright of the Clock Tower Company, Springfield News Sun article, undated, c. 1999. 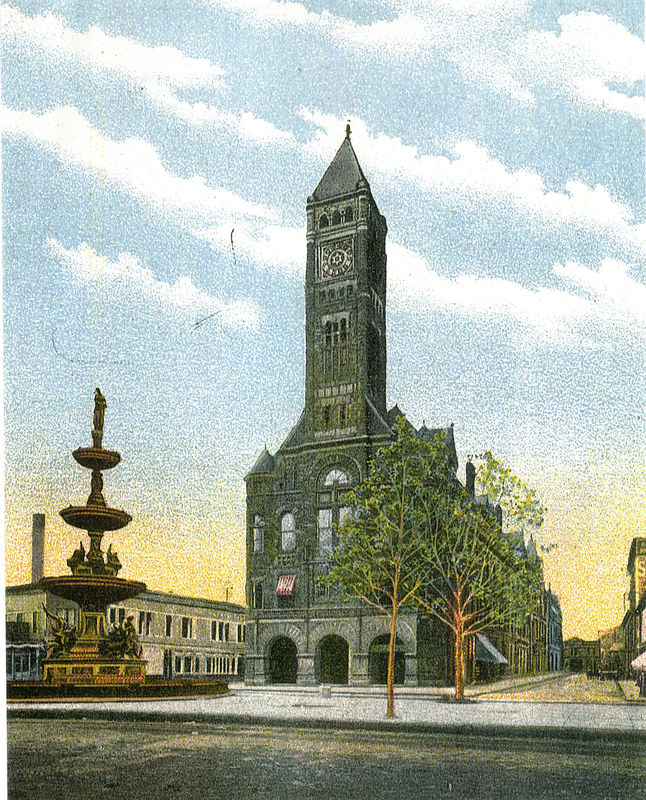 When the City Hall/Marketplace first opened in 1890, the tower was designed to accommodate a clock, but until 1924, there was just a decorative clock-like motif on the tower in place of an actual working clock. 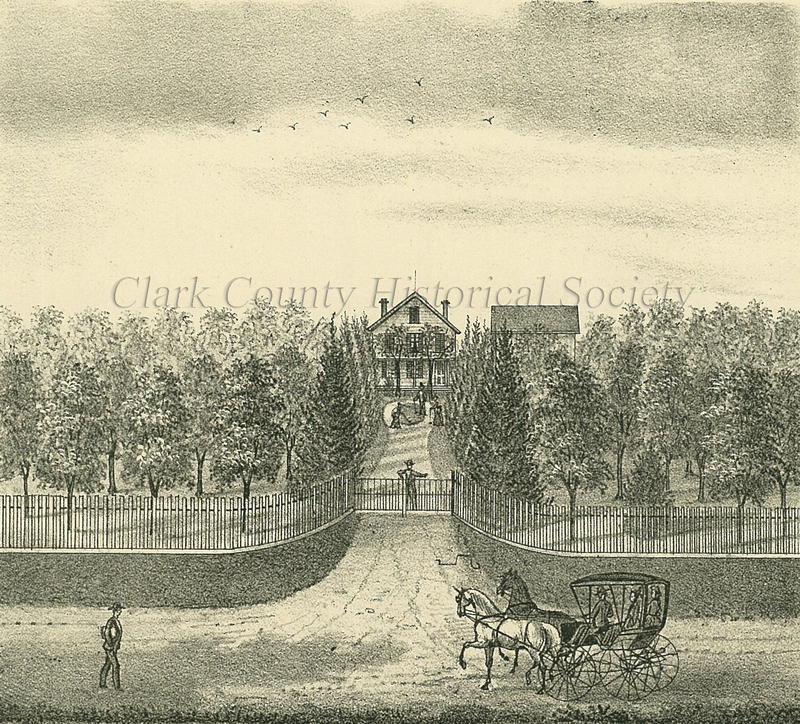 At the end of 1924 the clock was installed, a gift to the city from Howard Diehl in memory of his wife. The steeples on the tower were replaced with lighter fiberglass steeples around 2000 before the opening of the Heritage Center. 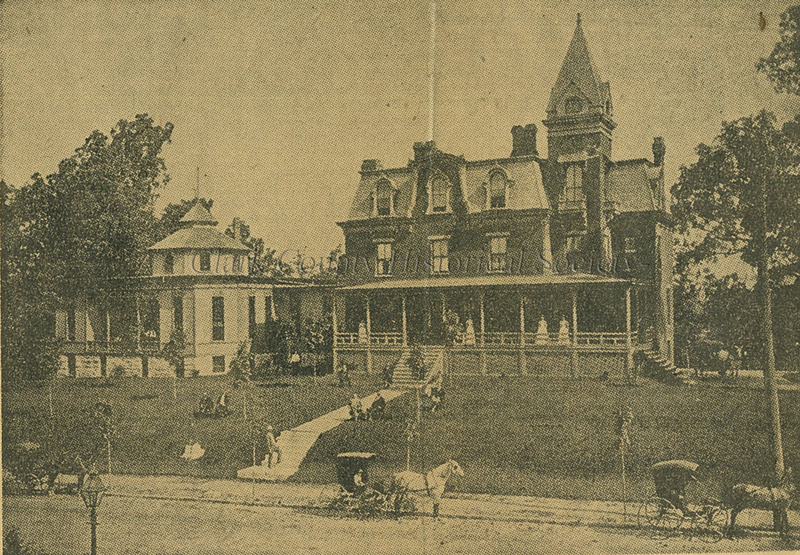 Postcard showing tower prior to 1924 clock installation.